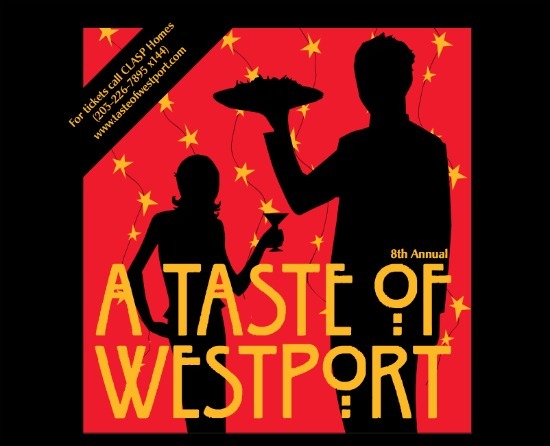 The 8th Annual Taste of Westport will be held on May 3rd at the Westport Inn. The Taste of Westport supports CLASP, a 30 year old Westport-based organization that provides group housing for 80 men and women with autism and related developmental disabilities. Your $75 entry fee ($80 at the door) gives you sampling rights to some of the Westport area’s finest dining spots, and you can support a great cause. Here's how the evening is going down: Begin with oysters or clams from Norm Bloom & Son, and then enjoy great restaurants, including Bobby Q’s, Blue Lemon, DaPietro’s, Matsu Sushi, Coromandel, Michele’s Pies, River House Tavern, Rizzuto’s, Tarantino’s, 55 Restaurant and Wine Bar and Rowayton Seafood. Relax with live jazz provided by the Carruthers Brothers as you sip fine wines from Greens Farms Spirits Shop and Black Bear Wines. Sample fun cocktails from Tito’s Vodka and EspolónTM Tequila, as well as wine and spirits from Hartley & Parker and CT Distributors. The evening'd emcee will be Chaz of the Chaz and AJ Show on New Haven’s WPLR 99.1 FM. Chaz will lend his lively persona to the event and add sound to our silent auction. Michele of Michele's Pies will also be available to sign cookbooks throughout the evening. For the complete list of the evening’s participants to www.tasteofwestport.com. Autism affects more than one in 100 children today and continues to foster a growing need for services for people with developmental disabilities. For more information, and to purchase tickets, please call Robin Hammond at 203.226.7895, x 144, or e-mail her at rhammond@clasphomes.org. To learn more about CLASP, please visit www.clasphomes.org.